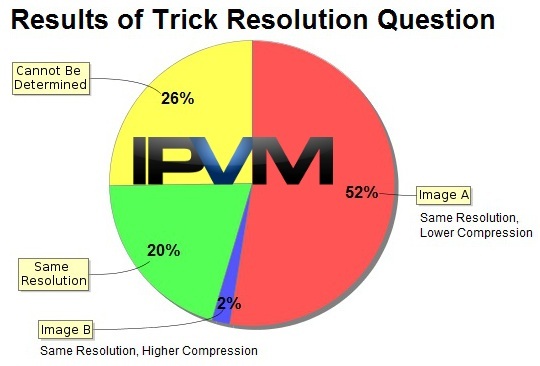 A common and important mistake confirmed: After years of manufacturer marketing that resolution equals quality, recent IPVM poll results of nearly 400 industry professionals confirms that most are fooled by this myth. We showed 2 images side by side and asked readers in our Video Quality Training report, "Which image has higher resolution?" with no further details provided and an option for 'Cannot be Determined'. The 'true' numbers are likely far worse. First, we revealed the answer in the following paragraph ensuring that at least some readers found the right answer below before taking the poll. Secondly, regular readers to IPVM have disproportionately strong technical backgrounds compared to the industry at large. With those factored in, 75%+ of the industry falling for this would not be surprising. Compression: As our Video Quality Training report shows, manufacturers vary their compression levels and the impact can be significant. WDR: As our WDR tests show, camera's ability to handle bright light varies widely. Low Light: As our low light shootouts show, camera's ability to handle low light varies widely. So when someone says a 5MP camera is 5 times better or replaces (5) 1MP cameras, simply because the resolution is 5 times greater, this is often false in practice. Indeed, we ranked this at the head of last year's Top 10 Surveillance Myths. While manufacturers often acknowledge that resolution equals quality is a myth, they frequently downplay the impact by saying that people know this. The reality is that is wrong. Most people do not recognize and can easily be fooled into thinking that a camera is better simply because it has higher resolution. While it would be great that some simple magic number precisely defined image quality, there cannot be. Too many factors impact this and only a better understanding of them will lead to proper selection and the right results.